I am a huge fan of Envirosax, so I was super excited when they contacted me and asked if I would like a sample and have a giveaway on my blog! 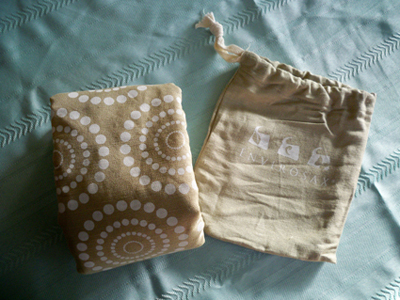 They sent me one of their organic bamboo bags. I love the texture of the bamboo and I love that it is 100% biodegradable and 100% sustainable. So would you like to win one of these awesome Envirosax bags? Just leave me a comment on this blog post telling me what you will carry in your Envirosax bag! I will pick the two best comments... so have fun with it! I'll leave it open until Friday at midnight and announce the winner here on Saturday! UPDATE: I can't believe how many comment entries I got! I am reading them and will post the winner as soon as I can! I would use the bag to take with me all the props I need (hats, cards with pictures with daily situations on them, balls) for the improvisational theatre course that I'm giving. It's called: (Improv)e your English and it is meant for people to learn to overcome their fear of speaking in a foreign language, to dare make mistakes and to improvise. I enjoy your blog very much! keep up the good work! I love your blog! I would carry: notes and random things the kids need for school, healthy snacks so I don't get tempted to buy fast food, books(!) to read, handt craft supplies (like the crochet project that is long overdue), and essentials like sunscreen, bandaids, kleenex, and Advil! So cute! I'd totally use it to carry all my junk (lunch, water, etc) to work so I wouldn't have to mess with shopping bags anymore. Super cute bags!!! Looks like a perfect knitting bag to me! Of course, in my world a knitting bag carries not only my knitting and knitting paraphenalia, but also mail, to do lists, directions (to places like a new friend's house and my divorce lawyer's office), my lunch when I'm going to work (I knit on my lunch break), books I'm reading or have just bought, sometimes wine...Yeah. Truth is my "knitting bag" is pretty much always a catch all and I love it. I will be carrying my library books! I would use it to shop at the Public Market, and then at Wegmans too. But mostly the market. I would take it to the library where we usually have a stack of DVDs and books on hold. Of course having a 2.5 year old means that the bag would also contain a hat, mitts and coat that I would pick off the library floor as she strips while running to play with the toys! I will carry my hopes and dreams for a sustainable future! As a grandmother to 7, a full time college student and works full time. Leash for my "Sugar" puppy. Snacks for both, children and puppy. The love notes from my husband, which I keep all of them with me at all times to read when I feel blue. I would use the bags for my groceries, to bring with me to school instead of my tote bag, to carry my knitting around, to throw things in to go home for the weekend, and so on and so on. I'm sure I could find lots of uses for them. Everything! It looks like the perfect size for taking things to work, a quick stop at the grocery, walking to the farmers market, a weekend away, and I think my cat would probably love to get in the bag, too! I will carry my farmers market goodies and my chihuahua and hope that she doesnt eat my sweet potatoes and cabbage. Our local farmer's market starts back up in April. We will be biking there this year and this bag would work beautifully to be thrown across my shoulder with all my local fresh produce. Since I hae started running, I would carry my running clothes in it or maybe my lunch everyday or maybe carry my son's extra clothes for school...the list could go on and on! 'Cos I'm carrying my snacks in Envirosax! I will fill this bag with all the local-grown farmer's market produce that I buy and eventually throw away. I would use it to carry my stuff to work -- my kids' cups and blankets for day care (day care's at work), my lunch, my book to read at lunch, my handmade baby and kid stuff I sell on Etsy (there's a post office at work), a pair of shoes to change into at work and whatever I've baked for my coworkers (I'll send a photo of the baked good in the bag if I win!). EVERYTHING! I am a young working/nursing student mommy, who loves to spend time with my husband, toddler daughter and baby pug Bella, so I carry everything for all four of us! I have been trying to make a list of some of the things that I would carry, but we do all kinds of things together so I keep thinking of all the possibilities and the list is just way too long! Looks like the perfect bag to carry some scrapbooking supplies for an impromptu scrapbooking session! Especially for making some mini-books! Also, looks great that it folds up to be kept in your purse so you don't have to remember to bring in big reusable bags into the grocery store when you're only picking up a few items! I would carry library books back to the library, my latest knitting project, a few dog treats and whatever else I need to tote. It looks like it's a very handy size for just about anything! I would probably not be the only person in my house to use one of those bags. 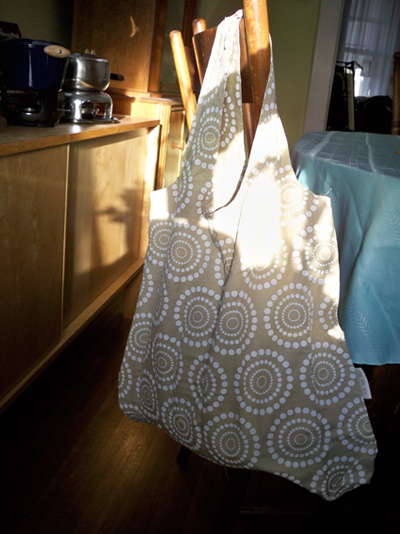 We have a collection of re-usable grocery bags that we take shopping to do our little part to save the planet. And this year my husband and I are growing our first vegetable garden! Of course, we got a little ambitious and now we have 45 squash/cucumber/watermelon/cantaloupe plants alone. Not to mention the tomatoes, radishes, carrots, tomatillos, red bell, cayenne, and jalapeno peppers, potatoes and onions. So we could also use that bag to haul vegetables to and from the back corner of the yard and the house! I would carry all the makings of a picnic for myself and my daughter! A blanket, speckled tin plates, bread and cheese, fruit, a thermos of cocoa, and a book to read together in the shade. I don't have an extra bag, so when I go to the weekly farmer's market on Sundays, I end up either 1) carrying a bunch of fruit & veggies in my hands, going from booth to booth, dropping some as I go or 2) stashing everything in my purse haphazardly, which can cause some bruising. I would use it when I am at the mall to keep all my new purchases in - save myself and the planet from all those shopping bags piling up in my house. It would also be great to take my lunch to work in! Love these big bags!! I would carry delicious food to become dinner, craft supplies, thrift store finds and more!! Great giveaway! I would use this bag at Farmer's Markets and farm stands during the warmer months and for general shopping the rest of the year. I have 2 or 3 other tote bags but they all have texture issues. The generic reusable bags I've got feel so rough and icky to the touch that I don't really like using them. I get the same feeling from burlap - it's like a shock to the system! I would definitely use it to load groceries in, not only at the store but also Farmer's Markets. I could also use it for lugging my stuff to the gym, or an umbrella and extra pair of comfy shoes to work, or even a bottle of water, some sunscreen and a good book for lounging on the beach! The possibilities are ENDLESS!! I will carry my small cat Ginger in it when we go for walks with the dogs, plus yummy snacks for everyone for when we get to the park. The significant other and I work together so we usually have our breakfast, lunch, and snacks all in one plastic bag. If I had an Envirosac I'd be able to carry all our sustenance for the day in one stylish and ecofriendly Envirosac! Yaye! I'd carry my baby in it. Aside from the obvious, 'groceries!,' I'd carry my change of clothes for the day that I volunteer at my local animal shelter right after work, stash it in my purse for trips to flea markets where vendors are always happy to not have to give away a bag and take it to the local Farmer's Market to fill with fresh veggies and fruit. These bags look really nice because they fold up into such a small, compact pouch that I can easily keep it i my purse and in truth, use it to carry ANYTHING! I would put my ballet shoes in there, and make it my ballet bag. It looks lovely! I would use the bag for groceries and knitting projects. So cute! I would use it for absolutley everything! Shopping, work, library, donating, volunteering, picture taking, vacationing and visiting! The possibilites are endless! So great to see that you were approached to have a give away, your blog is the bomb!!!! cute ain't it? i was so excited to see you blog about it but din notice it was a giveaway till i read the comments. id use it to carry some cloth to make some bags to buy more cloth to make more bags to carry more cloth :) and since its compact, light and convenient, id put the envirosax i alredi have in it so i can, you know..carry more cloth..lol. I use the reusable bags from the grocery store already, but they don't fold up into a little ball. I would use an Envirosax to keep in my purse for other things that I purchase, like craft supplies or dog and cat treats! Those are really the only other things I buy other than groceries! That way I could use it, then wad it back up into my bag every time I need it! I usually would use my bag for groceries, boring, I know, but last February my sister used hers for Mardi Gras beads! So, yeah, Mardi Gras beads! And then groceries!!! What a great design! Great for library books--my 6-year-old and I frequently make spontaneous trips to the library. What wouldn't I carry? Groceries, books, DVDs, lunch to work! I would take it to the farmers market with me. It looks small enough to stuff into a pocket on the bike ride over and then I can just hang it off the bike when it's full. Carrying a heavy load is so much more fun when you have a cute bag to carry it in! This would probably be a full of great books from the library each week - the kids always want to check our more books than I want to carry. I can also see it full of art supplies and projects, groceries, of course, and coming soon.... all the little things a baby needs! During the week: as a botanist, my pockets are always full of random pens, rite-in-the-rain notepads, twine, tags, etc.... on some days my pockets get so full, I feel like a walking stationary closet! It would be nice to walk around with a stylish bag with all my supplies around the Arboretum. The best part is that the bag is waterproof, which is perfect for the rainforest environment that I work in. During the weekend: I would try and fit as many papayas, pineapples, and rambutans from the farmer's market. That way, both of my hands would be free for me to double-fist a ginger limeade and a plate of fried green tomatoes! I would use the bag for groceries, trips to the library, weekends to see family, days at the beach, to carry lunch, times I need a bag instead of a purse... I think I'd use it for just about everything. Yarn, yarn, yarn and more yarn...enough said! I'd repurpose the Envirosax as a gift bag. Will fill it with birthday presents and then ship the package to my 5-year old nephew in Canada. This way, he gets his real presents AND a cool eco-bag to carry the toys and books in. home again, home again jiggety jig. home again, home again jiggety jog. home again, home again jiggety jug. home again, home again jiggety jag. I would take this to the grocery store and carry my food. I would carry my baby girl's toys, diapers (cloth), and stuff she needs for day care in the Envirosax bag. She'd be the coolest kid on the block (as well as the cutest). I would take it to the grocery store with me. I've only got 2 bags now which is my excuse for not buying bacon and cookies. I need more room to carry my junkfood back! Well, of course I would take it to the store! I have several bags but none so fashionable as this one. I think it would be a great breakfast/lunch bag as well - I eat both of those meals at work and it's far less dangerous to keep them in a separate bag than to cram the food into my purse. One exploded yogurt is enough for me, thank you very much! Ooh, I could also use it to tote around my pink Nintendo DS with all it's games. Lots of uses for these little guys! I would use it to carry diapers and wipes because it is infinitely more chic and ecologically sound than the typical diaper bag. A treat for myself would also be included! 1) My paycheck, because I'll use it to bring in my lunch, instead of buying. 2) My feet, because although my heels look great while at work, I need comfy shoes for my commute. I'd love to play! Thanks for the chance. I'd use mine for groceries, for hauling around my knit projects, and as an impromptu diaper bag for short outings. I'd use mine to carry the clothes I am about to clean out of my closet to the consignment and thrift stores. Donating and buying used clothing is a greener (and more budget-conscious) way to feed my shopping cravings! I'd use it to carry my library books, packages to mail, groceries, iPod, and of course...my pug! The littlest one, if she'd let me! That looks like the perfect bag to carry a kitten in! I'm totally kidding...this bag is screaming for some great greenmarket groceries, and as a New Yorker I try to visit the Union Square Greenmarket as many weekends as possible. I'll use it for dirty laundry to do at my bf's house. Well, for him to do anyways. Hmm... It would sadly probably end up being used to tote my teaching supplies and instruments to and fro between the several schools in which I am the music teacher - which is a good life for a bag, although not the one I might want. Since I have to carry my baby up three flights of stairs to our apartment, I would use it to carry everything else, like my wallet, keys, some groceries, cell phone, mail and I would still have one hand free for a mocha frappuccino! I'll carry my Girl Scout stuff to model Going Green for my girls. I would definitely use it to bring supplies to our council event titled Go Green Globally. It's right in the Girl Scout Law: Use resources wisely! What would I carry? Two things. It would be filled half full of Lindt Chocolate (because I lurrrrve chocolate! ), and the other half would be my Catholic guilt, because I would personify gluttony. But, if you picked me, I'd share! Stuff for work - papers, lunch, etc. Stuff for church - sunday school books, kids' books, snacks, toys, etc. Who knows! But can't you always use another bag?! right now i use my reuseable bags to carry groceries and miscellaneous items, but my faaaavorite thing to carry in reuseable bags is my cat Zebbie. he loves to run into the bags when they're on the ground, then i pick it up by the handles and swing him back and forth. he loves it! no really. this would be really nice. I have one evirosax bag already and have been meaning to get more to help with eliminating having to get the bad bad plastic bags at stores. So I would obviously use it at the grocery store, also at the farmer's market, and to carry library books. This bag would come in handy during one of my upcoming trips to the local Farmer's market this summer with my 1 year old son. I'd love to start teaching him how to buy local, and live green! I love those bags!! I would carry my groceries from Fresh & Easy! And my David Sedaris books! I'm thinking my three year old. She can throw a mean temper tantrum and she might be a little more inconspicuous in the Envirosax. I'm sure that one didn't make the wipeboard in the Envirosax board room. Lots of things! But I think mostly in the dead of night I would sneak over to my neighbour's house and steal their teeny weenie chihuahua/daschund cross because he is the cutest thing ever! He loves sitting in purses so it would be perfect! thanks so much for your blog! I carry a similar bag with me all he time in case I stop at the market or library on the way home... but the one I have is yucky nylon. I LOVE bamboo. Bamboo towels, sheets, it's all fabulous! 2. A small composting bucket - Seattle recently started taking food waste in yard waste bins, so now even those of us who live in apartments without a yard can compost! My husband and I need a small bucket with a filter to accomplish this. 3. Lavender essential oil - I was reading the book "Curly Girl" by Lorraine Massey recently, and she recommends making a lavender spray at home to keep curly hair looking curly. Lavender essential oil is the first of two ingredients. The second is water. 4. A spray bottle for the homemade curly hair lavender spray. The recipe makes 1/2 gallon, but the book recommends toting a small spray bottle with you to freshen up curls throughout the day. 5. A set of two Orla Kiely Sky Abacus mugs - to be used at home with my Harney & Sons Summer Peach tea. Delicious! I would put the spray bottle and the lavender essential oil inside the composting pail, then put the pail in the bag with the mugs and the counter spray tucked in on either side. After its inaugural use, I would return the bag to its pouch and keep it in my purse for further adventures. I would love to use it at the Farmers' Market and grocery store... and probably everywhere else I go. i'd use it to sneak my dog into shops and stores that wouldn't allow a harmless little pooch inside! pick me! aside from using it at the grocery store, i'll take it shopping at the mall with me. they have some cool designs! i would use it when going shopping for clothing. i find clothing store bags difficult to reuse b/c of drawstrings or strange sizing unlike plastic grocery store bags which i use for kitchen trash (i normally use trader joe's reusable bags for grocery shopping but i occasionally have to get plastic on impromptu grocery shopping trips). actually, the envirosax would be great to carry at all times in my bag for those unplanned trips. my dad bought some envirosax in my least favorite patterns so i haven't been very good about carrying them. i really like the organic one, though! I'd use it to put all my produce in so it wouldn't get squashed between the heavy stuff. I hate that! I won't use it for my groceries, since I already have a bunch of bags for that. I think that if I won this bag, I would use it as a diaper bag for my daughter. Things get thrown in and out of that bag and it goes through the ringer, but this bag looks like it could handle all of our diaper bag needs. It's got character too! In my Envirosax bag I would carry my entire collection of Star Wars Beanie Babies and assorted action figures for moments when I feel compelled to engage in Public Transportation Sci-Fi Theatre. I would use the bag for my husband's wheelchair. It is hard to find bags wide enough to go across the back bars since he uses a wide chair. He is in kidney failure and I have to keep some kind of bag on the back to carry his urological supplies and various things he needs for his health. This bag looks deep enough and wide enough. It is also beautiful. Thanks for considering me. I would use my Envirosac for all of my little boy's goodies that I carry around every day - his favorite book of B&W animals, his sippy bottle with soccer balls on it, his striped fleece that has to go EVERYWHERE with us, his plastic drumsticks, plus my little zippered bag with diapers, wipes, booty cream, sunscreen, hand sanitizer, baby sunglasses, sun hat, extra pants, and baby Tylenol. Whew - hope it's a roomy bag!! For farmer's market adventures! And Trader Joe's too! Perfect tranport for tasty eats! Kid stuff for around town. Cans of Chef BoyarDee Ravioli and organic fruit. I'd take this bag to the farmer's market. now these I would remember to carry with me. very portable. how often I leave the bulky squarish ones at home by mistake. even the little pouch they come in is cute! on a recent shopping excursion my current bag held a 2L bottle of dark green tea, pull ups and fresh italian bread. question is though, is it tacky to use the target bag at wegs? they are much cuter. As a soon to be first-time Mom, I would use it as a diaper bag for when my little man, Henry James, arrives in June. Our son will be eco-friendly from the start! The contest closed at midnight Friday 27th. I did not expect sooooo many comments! I will be reading these and posting the winner as soon as I can! Jackson has become a very smiley baby. I got this chart to track his growth and look how happy he is about getting bigger!